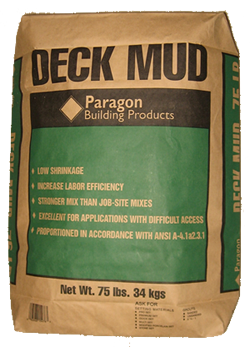 DECK MUD from Paragon is a VERSATILE leveling mortar that can be used not just for sloping shower pans but is a BULLETPROOF system for raising and leveling floors. Lab test show that PARAGON DECK MUD achieves high levels of compressive strength when dry-packed or applied in a flow-able consistency. It provides a rock-solid underlayment for interior or exterior tile or paver projects. It is also much more ECONOMICAL to use than self leveling mortars and has become the DECK MUD preferred by tile contractors.